LOOK ...What I got today!!! 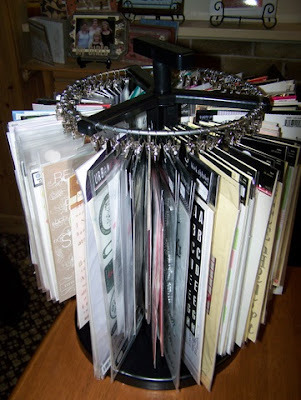 How exciting (LOL) today I was lucky enough to get myself, from SCRAPSIDAISY, this excellent CLIP IT UP organiser. I am in my glory! It is unreal! I have had fun filling it this evening & YES Leisa I do have some spare clips left to fill.LOL!! Make sure you head over to the SCRAPSIDAISY blog to put your name in the draw to have a chance to win one of the RAKS that Leisa has on offer. There are only a few days left, so you had better be quick. It has been a while since my last post. I won't bore you with the facts. I have had the Flu & have been feeling rotten. BUT I am now able to share for anyone that would like to look. 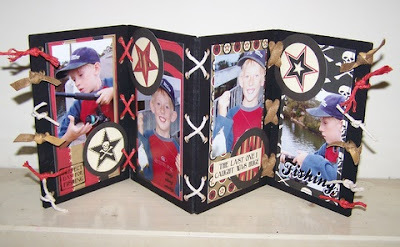 The picture above is a book that I created recently to give to my sister for her birthday in July. I used the beautiful, bright Junkitz range of papers. It doubles as her birthday card. 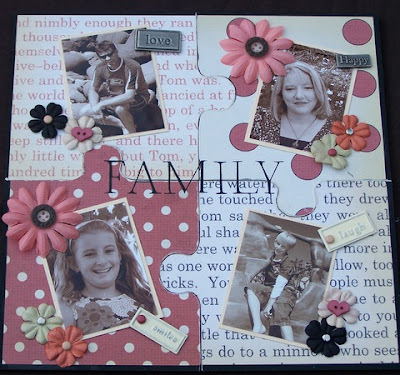 This pretty little pink page I created (just tonight) using the NEW Heidi Grace range of papers that Leisa has in at SCRASIDAISY . I only started scrapping about 3 years ago. My kiddies have been photographed endlessly ever since. So I haven't really scrapped their baby photo's. The lovely Debbie Kingston has been re-scrapping hers So this has inspired me to actually start scrapping my kiddies as babies. And my final page for tonight was created using the (Bestest) 3 Bugs In A Rug COCO patterned paper range. I have had it in my stash for a while now & challenged myself to use it. I don't like using my favourite papers. silly huh! Finally I will leave you with a collection of photo's to show you how we spent our afternoon! After a morning at soccer (where Brock was very very excited!!! to score his first goal) we headed to the local river to FISH!!!! Something that Brock has a passion for. We had a bribe going all week - to keep him in his bed. If he could do that we would ALL go fishing on Saturday afternoon. He succeeded (well almost) so it was off to the river for us. (it was about as exciting as watching grass grow) I am glad that Brock enjoyed it though. But before I go ......No matter where in the world you live. 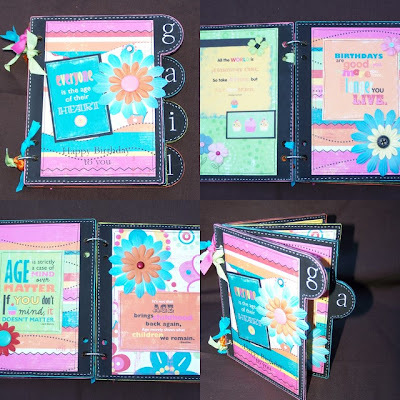 Don't forget to visit the SCRAPSIDASIY blog to check out the R.A.K(s) that Leisa is giving away there. Just thought that I would share another project that I have completed. 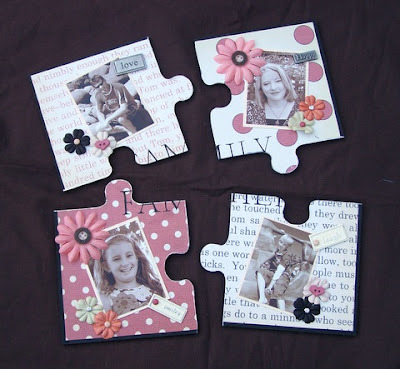 It is a wooden 4 piece puzzle that I have decorated with the lovely new Jenni Bowlan range of papers.All of which are available for purchase from SCRAPSIDAISY. It shows my family in pieces...... fortunately we are one solid block! 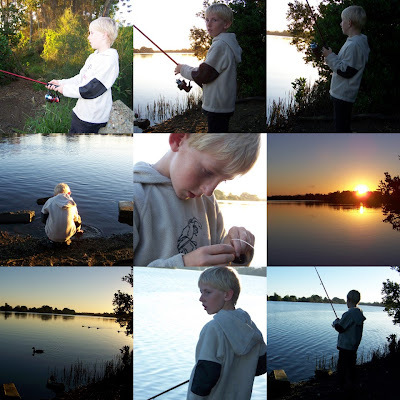 Anyone that knows my little Brocky knows how much that fishing means to him. He doesn't JUST love it..... he Breathes it, dreams of it, talks of it etc etc etc. So a new project with a recent fishing trip had to be the next project. The fish are not that impressive But it never matters to him what size they are (all that matters is that he catches more than Dad). The papers that I used are the Junkitz Extreme BOY range. 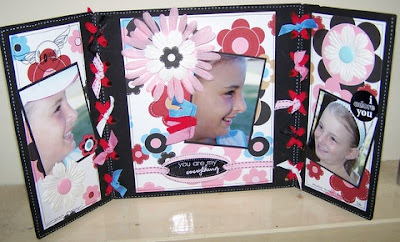 And did I mention that it is available from SCRAPSIDAISY . That's it for me for creating for the next few days (yeh sure) I have managed these last 3 projects over the last 2 nights. But you never know I might still be in the swing after work tomorrow night. My latest project to share is a wooden Kaiser lace up journal. 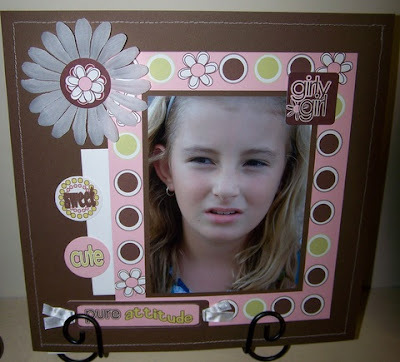 I chose some favourite photo's of my beautiful daughter & the delicious Urban Lily range of papers & rub-ons. It is a very bright & vibrant range & has all come together beautifully!!! It was enjoyable working with this lovely range. Another new project that I have just created and wanted to share. 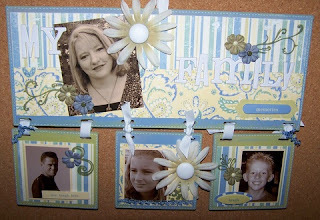 I used the Lovely making Memories Fresh Anthology range to create this family wall hanger. I think I need a new photo of myself though! I had this one taken recently and am using it on everything I create lately....Sorry as it is not often that I get a photo of myself that I like. This is my latest project! 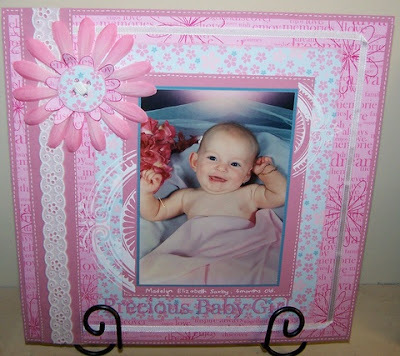 I have created this shadow box as a sample for an up & coming class to be held at SCRAPSIDAISY in the near future. I have used the lovely new WeR Memory Keepers/Precious Metal range of papers. These papers are to die for! 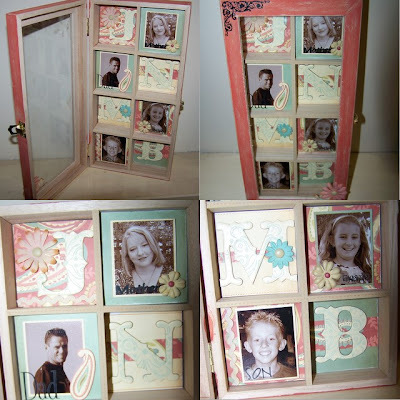 It showcases each member of my family 7 will be another gorgeous addition to my shadow box collection. Just busting to show how my family spent the day!!! 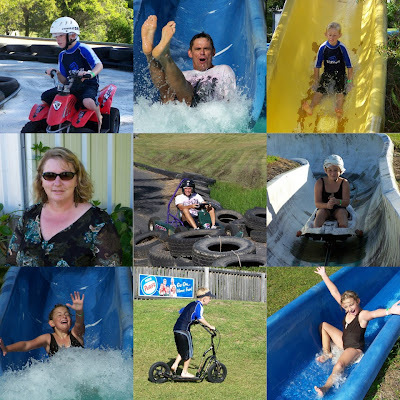 !What a BUZZ we had at the local "BIG BUZZ" Fun park. We were there from the time that it opened until the time that it closed!!! 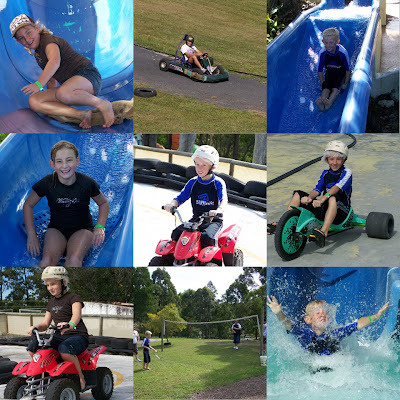 The kids had the best time EVER. There was not one thing at the whole park that the kids (husband included) didn't try out!! The water slides were a hit with Maddy. Brock just loved the quad bikes. This was all possible THANKS to one very special person. You know who you are. So THANK YOU from the WHOLE ENTIRE FAMILY!!!!!! We had a pretty full on weekend. 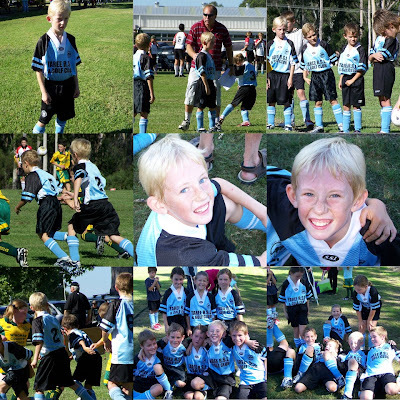 Saturday was Brock's first ever game of soccer. He just thrived on it. From the start to finish (and for hours afterwards) he just glowed. He was in his glory. Not much scrapping done on the weekend but I do promise that I will have some to share tomorrow night. I have just completed this page & thought that I would share IT. 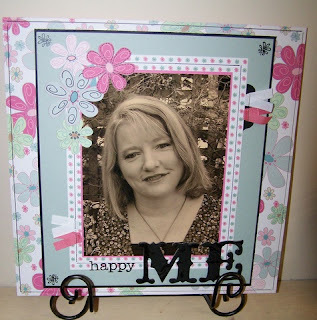 It is always hard to scrap a page of yourself.So I thought that I would make it a page about why I am HAPPY! On the tab, that has the ribbon attached (on the right) I have journalled about why I am Happy. It reads " Happy ME....I have every reason in the world to be HAPPY! I have a wonderful understanding HUSBAND. I have the most adorable SON & DAUGHTER in the whole world. I have the BESTEST job that you could ever ask for. I have a wonderful network of FRIENDS. I have a Loving & supportive FAMILY.SO........That Is why I am HAPPY!"